People with intellectual disabilities (ID) are accomplishing more than anyone ever thought possible, as Special Olympics athletes prove every day around the world. Yet, not that long ago, attitudes were very different. When Eunice Kennedy Shriver wanted to create a summer camp for young people with ID, she was told myth after myth, including that physical exertion might even be harmful. Later, when she wanted to hold a “Special Olympics” in Chicago that would include swimming, organizers heard more myths, including that people with Down Syndrome had “negative buoyancy”—and would drop in the water like rocks. For Shriver, the whole point of such sports events was to change people’s attitudes. So she made sure swimming was included in those first Games in 1968—and ever since. Since then, athletes with Down syndrome have emerged as versatile sports stars—from swimming to track & field to gymnastics to judo. More recently, they’ve embraced a new milestone: taking on endurance sports, such as the triathlon and open water swimming. For Anne McLindon, longtime swimming coach and Technical Delegate for open water swimming, the 2019 World Games Open Water Swimming event provided a moment to take in how attitudes have changed about the capabilities of people with Down syndrome. 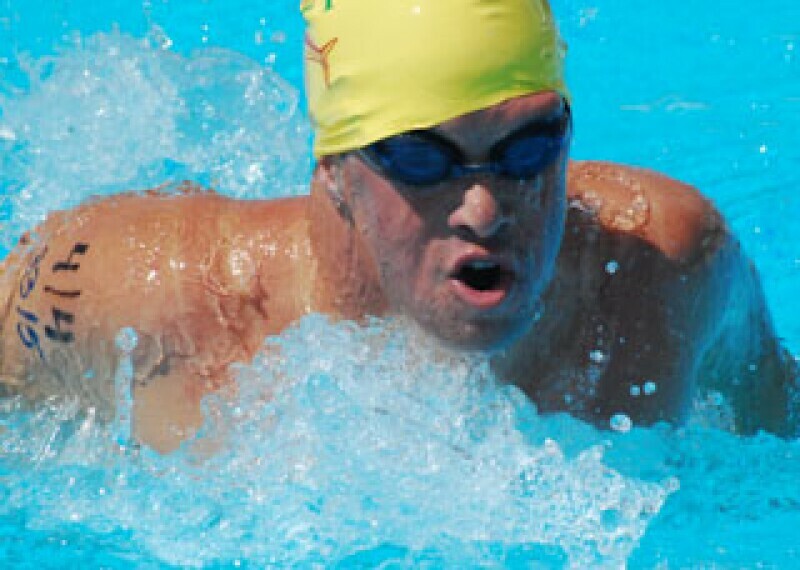 The rigorous open water swimming (OWS) event has been part of the last three Special Olympics World Summer Games. Talented athletes with Down syndrome who’ve taken on this 1500m+ challenge include Andy Miyares and Lee Scharf, USA; Kanza Bodden, Cayman Islands; and Conor Macauley-Conway, United Arab Emirates. In addition to OWS, there’s also the Special Olympics triathlon. 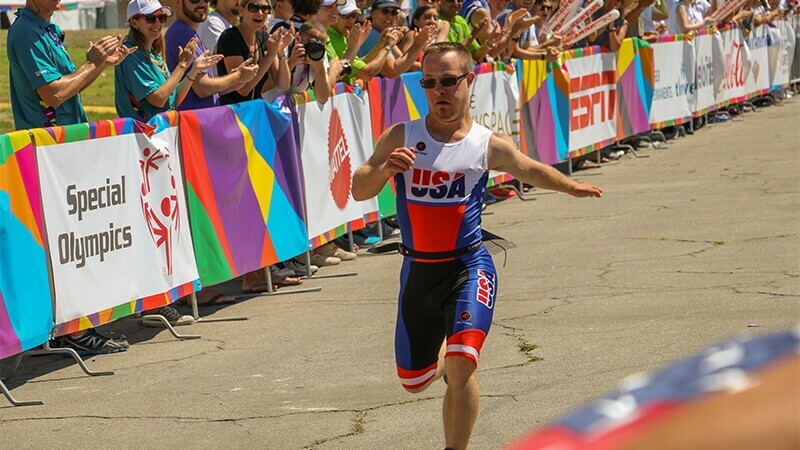 At the 2015 World Games, USA athlete Ben Heitmeyer became the first athlete with Down syndrome to compete in the first triathlon in Special Olympics World Games history. She adds, “Ben was an inspiration. He knew his coaches and family were counting on him. He gave all of us a sense of we can do it because we have each other.” He cycled 12 miles, swam 750m, and ran 3.1 miles. "You just have to smile with so much joy when you see him do that," says coach Rumer. "Before he even gets to that corner, when you hear he's a half-mile out, you get so excited because you know he's going to live the dream of being proud of himself—and everyone responding to that." In recent years, there's been so much progress and changed attitudes—among everyone! Coach Anne McLindon saw it during the 2019 World Games. 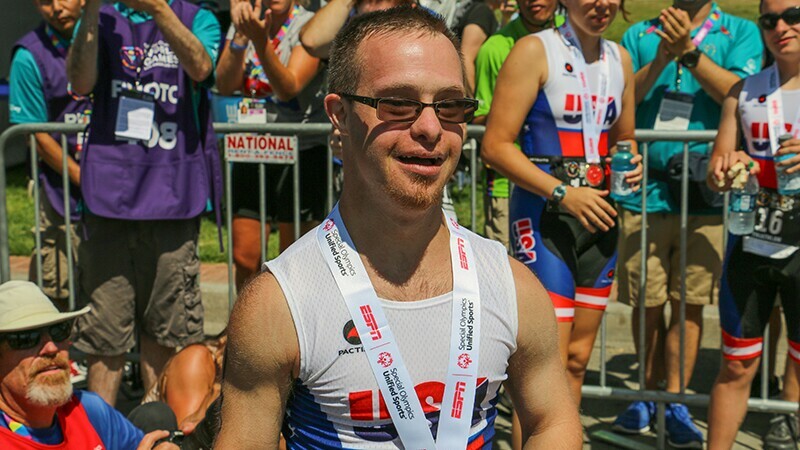 “My moments on the beach watching open water swimmers with DS are filled with profound gratitude for all the families, coaches and communities who have encouraged, supported and believed in the ability of these athletes and provided opportunities for them to shatter the stereotypes and show the world their amazing talents and abilities." 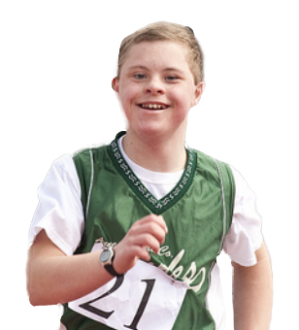 This year, World Down Syndrome Day happens on the closing day of the 2019 Special Olympics World Games. 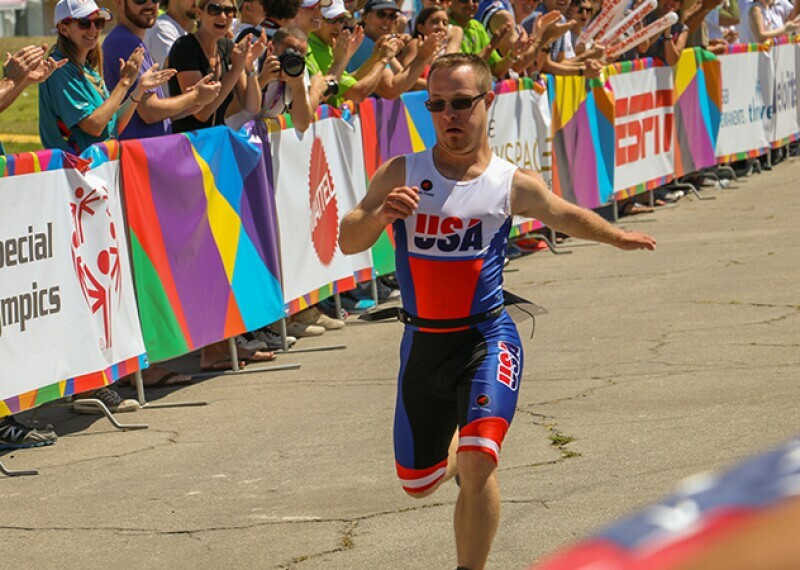 All through these seven days of competition, people with intellectual disabilities—including 1000+ athletes with Down syndrome—have been showing their world their wide-ranging skills and talents. 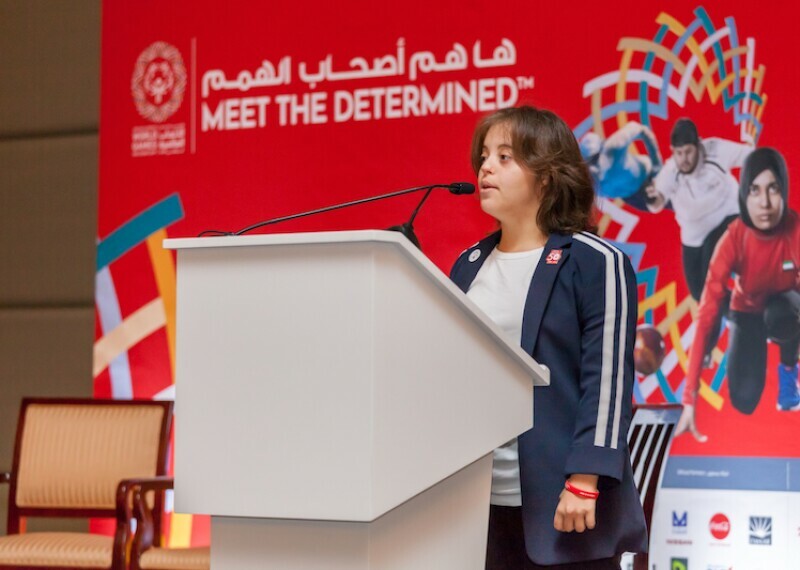 This also includes athletes with Down syndrome leading as coaches and officials, including USA's Lani deMello serving as a rhythmic gymnastics Technical Delegate, as well as administrative and creative roles all across the United Arab Emirates Local Organizing Committee. By Special Olympic athlete, Chaica Al Qassimi, a Technical Officer, Judo, Special Olympics UAE team. Read more content about Down syndrome.